The Presidential Palace in Athens is an important landmark. The Presidential Mansion is the place to be to see a Changing the Guard ceremony in Athens, Greece. This place is mostly visited for its Changing of the Guard ceremonies that take place here and the Tomb of the Unknown Soldier, which is off Syntagma Square below the Hellenic Parliament. For those of you who cannot catch up the ceremony can atleast marvel at the mansion which is one of the most magnificent examples of the architectural legacy designed by Ernst Ziller. This is also an ideal place for leisurely strolls and getting to know the contemporary culture and people of Athens. 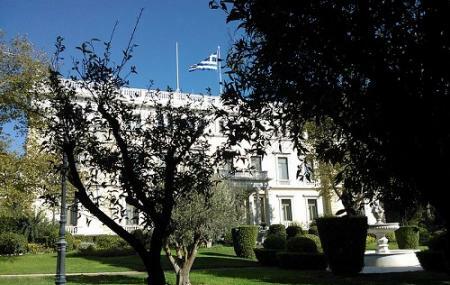 The Presidential Mansion is the official residence of the president of Greece. Until the early 1970s, this mansion served as the Royal Palace. The construction of this mansion began in 1891 when the Greek state decided to present the Crown Prince Constantine with a private mansion. The mansion was built by the famous Saxon architect Ernst Ziller who later on went to construct over 700 buildings in Greece. A ceremonial change of guards takes place every Sunday at 11:00. Witness the change of guards’ ceremony every Sunday at 11:00 AM. Check with the local tourist office for exact tour timings and ticket prices. How popular is Presidential Palace? People normally club together National Gallery and Filopappos Hill while planning their visit to Presidential Palace.